Ms. Frautschi began the violin at age three. She was a student of Robert Lipsett at the Colburn School for the Performing Arts in Los Angeles. She also attended Harvard, the New England Conservatory of Music, and The Juilliard School, where she studied with Robert Mann. She performs on a 1722 Antonio Stradivarius violin known as the "ex-Cadiz," on generous loan to her from a private American foundation. Selected by Carnegie Hall for its Distinctive Debuts series, she made her New York recital debut in 2004. 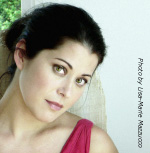 As part of the European Concert Hall Organization's Rising Stars series, Ms. Frautschi also made debuts that year at ten of Europe's most celebrated concert venues, including London's Wigmore Hall, Salzburg Mozarteum, Amsterdam Concertgebouw, Vienna Konzerthaus, and La Cité de la Musique in Paris. She has also been heard in recital at the Ravinia Festival, La Jolla Chamber Music Society, Washington's Phillips Collection, Boston's Gardner Museum, Beijing's Imperial Garden, Monnaie Opera in Brussels, La Chaux des Fonds in Switzerland, and San Miguel de Allende Festival in Mexico.